The Victorian Gothic & Art Deco Ensemble of Mumbai represent the modernization of Mumbai into a cosmopolitan city by the late 19th century. 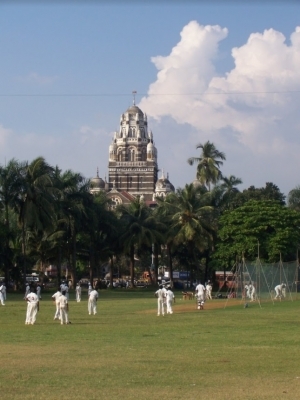 The nominated area includes 94 historic buildings and the open green space of the Oval Maidan. They were created during the two major urban expansions of the city, adding Victorian Gothic public buildings in the late 19th century and Art Deco commercial/private ones in the 1930s. The Oval Maidan is at the centre of these. The area also has some interesting Indo-Saracenic and Classical Revival architecture. I visited this WHS in November 2016. The aerial view of the Oval Maidan from the plane in a way reminded me of Central Park in New York City - a lovely green area surrounded by urban buildings and heavy traffic. My initial impression was confirmed later on when we caught a taxi a drove through Marina Drive and close to Oval Maidan. The traffic in these areas is incredible not to mention the several high rise buildings everywhere. I remember clearly though that there were several Art Deco buildings along Marina Drive that stood out among the rest of the concrete jungle even though most of them could use a lick of paint. The most central and striking of the lot was the Soona Mahal with its round turret (top right photo - towards the centre). 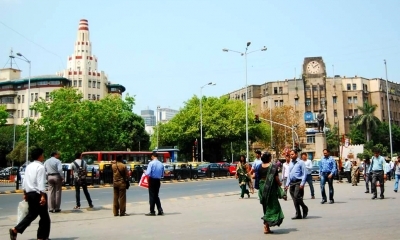 This building was chosen as the most iconic Art Deco building in Mumbai's WHS nomination posters. 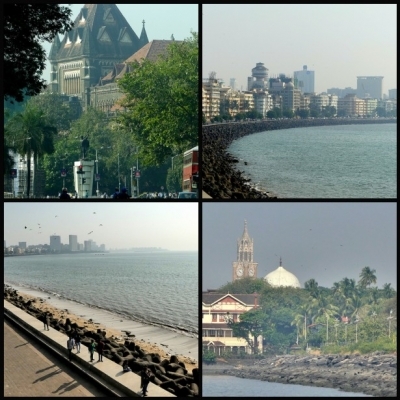 The Marina Drive (bottom left photo), nicknamed Mumbai's Corniche, offers a pleasant walk and a good opportunity to take in the Art Deco buildings in this WHS. The nomination maps on UNESCO's official website list all the inscribed buildings. My favourite part of this WHS though is definitely the Victorian Gothic ensemble around the Oval Maidan. If truth be told it is more of a continuation of the same style as Mumbai's Victoria Terminus and Municipal Corporation Building. The only worthwhile difference is that you can enjoy some fine cricket along the way. It is impressive that parts of this area have remained the same for years. This can be seen if you compare Ian Cade's colour photo with one of UNESCO's black and white photos of the Oval Maidan with cricket players and the Western Railway Headquarters in the background. The most iconic Neo-Gothic buildings of this WHS in my opinion are the High Court (top left photo) and the Rajabai Clock Tower (bottom right photo) and Convocation Hall which I spotted again when coming back by boat from Elephanta Island. Even though I earned another tick on the WH list, I don't think that this is one of the best WHS and I don't believe it provides any OUV. It will definitely pave the way for Delhi's tentative WHS in the near future though. Reaching Mumbai via the Chhatrapati Shivaji Terminus (CST) was indeed special, and I waited for 3 years before I could apty claim to have ticked off a rare feat: that I was able to visit a WHS by arriving at another separate one. My friend who picked me up at the terminus and I spent some few hours in the inscribed property of Mumbai before heading out to Elephanta Island. Contrary to the image of Mumbai in mainstream media being so busy, dirty, and crowded, I was pleasantly surprised to find out that that part was not as bad as I thought! Our wandering from the Fort precinct to the Oval area was a wonderful experience and that face of Mumbai really looked like it was taken out of London, with an Indian flare to it. Just a few metres away and you get into another world altogether, the Art Deco ensemble, which I wished I also spent more time on. Overall, it is not hard to understand and see why Mumbai is a true world-class city not only for its economic and trading role in history, but, more importantly, for its architectural gems. In 2017, Mumbai also bagged several recognitions in the UNESCO Asia-Pacific Awards for Cultural Heritage Conservation, all of which are under its Victorian Gothic component. The St. Thomas Cathedral was awarded too in 2014, and I enjoyed very much checking it out. Dining at the historic Leopold Cafe in Colaba area was memorable as well. I, however, am interested to know what might happen to the extension nomination to include the Churchgate Railway Station in the present CST-WHS. I understand that the CRS is already within the inscribed property, but I wonder if it will still be pursued to be inscribed on its own merit as a serial component of the CST, considering that ICOMOS was quite firm and clear in arguing that the CST and the Victorian Gothic and Art Deco Ensemble of Mumbai have different OUVs? The heat drew me away from the cricket and led me to engage more firmly with one of the city's Art Deco treats. As I was in Mumbai it would have been rude not to go to a cinema (though the draw of a cool dark air conditioned interior was almost as strong as my cultural desires) but with visiting time short and unsure of the subtitle situation I decided to forgo a traditional Bollywood movie, instead watching any English language film there was being shown (Hello to Jason Isaacs in Harry Potter and the Deathly Hallows pt1). So I headed off to the lovely Regal Cinema, which I certainly recognised as Art Deco. I was really happy to have engaged in the cinema going experience in India which was a much more lively and interactive experience than I was used to even if the cinema was very similar to my local one in London and seeing the Number 19 bus to Finsbury Park projected on the big screen gave me yet another taste of home. In the evening I decided to treat myself on the last night of my holiday with a cocktail at one of the swanky bars on top of the hotels on Marine Drive. This area is one of the main focuses of the nomination, and there are an awful lot of Art Deco buildings along the waterfront. However, again, I don't really remember the Art Deco aspects, mostly I just remember the slightly bland international corporate hotel architecture. But certainly this was because I wasn't paying attention as there are some lovely examples along the waterfront. With the Soona Mahal being a particular highlight. This website and its associated Instagram account are a great resource for picking out the highlights. As it was, the cocktail was reasonably enjoyable, however my stroll along the renowned Chowpatty Beach afterwards proved much more to my taste, there was a lovely family atmosphere and a friendly group of kids helped me to get the best Vada Pav and Bhelpuri available from the multiple food stalls. The water was about as uninviting as any I have seen though, so don't pack you towel expecting a swim. So, I seem to have covered all of the nominated area but beyond my cinema trip I don't have any particularly strong memories of the Art Deco buildings. Now that says a fair bit about me not paying enough attention, but I will also say I tend to focus on twentieth century architecture when travelling, yet the buildings in Mumbai didn't grab my attention. Perhaps his is because some of the listed buildings aren't presented in the best light, I still can't really fathom what the renowned Watson's Hotel is supposed to be under its rusty clutter. In fact I think the street level bustle and jumble of the city perhaps distracted me from the architectural ensemble above my eyeline. 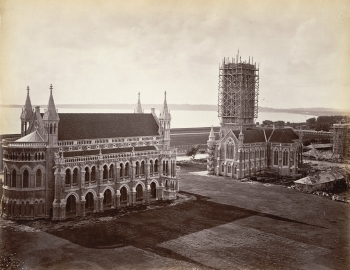 It is worth noting that two of Mumbai's most famous landmarks, Taj Mahal Palace Hotel and the Gateway of India, were built in the same period as the inscribed buildings and sit in the same area of the city, yet aren't included, However, if you have visited them, you almost certainly would have passed through the core zone of this WHS. I think the area of central Mumbai is a really interesting architectural ensemble mixing aspects of European and Indian architecture, with the strong flavour of British in the Victorian Gothic aspects certainly shining through, though this would feel more like a logical extension of the already inscribed CST. The Art Deco elements are there, however it needs a keener eye to pick them out as a larger ensemble, rather than the odd bit of detailing. "In compliance with paragraph 61 of the Operational Guidelines, the examination of this nomination is postponed to a future session of the Committee"